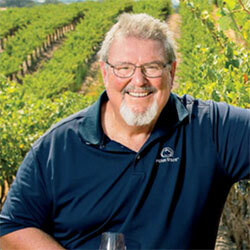 Gary Eberle, began his forty-year career in winemaking in the 1970’s. After achieving academic and athletic success at Penn State University and while pursuing his doctorate in zoology at LSU, Eberle met a professor who introduced him to the world of wine and soon changed his life. In 1973, Eberle made his first trip to Napa and entered the UC Davis winemaking doctoral program. Four years later, Eberle was heading his family’s Estrella River Winery. In 1980, he co-founded the Paso Robles Appellation and in 1983 Gary opened the doors to his own Eberle Winery. Today, Eberle handcrafts 30,000 cases of wine each year and consistently remains one of the highest award-winning wineries in the United States.